text at the top e.g. ; "granny's notes"
text at the bottom eg. "love, jayden"
Personalised hard back red notebook, printed with your own special photo and text lines. 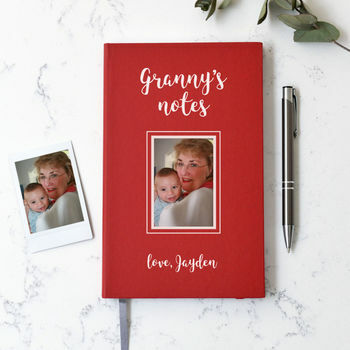 You can add your own text to the top, for example "Granny's notes" followed by a photo of your choice and then finally some text below the photo, for example "Love, Jayden". Once you have placed your order, we will get in touch with you to receive your photo. Please make sure you send high resolution, large photos for printing. If your photo is too small, it will not print well. We will let you know if we feel the photo you have sent us will not print well. The notebook comes in our classic matt finish with white, ruled paper. There is a handy colour-coordinated vertical elastic band as well as a stylish ribbon marker. Classic matt, hard back cover with white lined pages. This product is dispatched to you by Cherry Pete.